This is one of my favorite races in the DFW area! I love the swag, the medals, and especially the hot chocolate! The course is great for a PR and easy to negative split, if that's your thing, with the back half of the race being mostly downhill! Parking can be a pain, and traffic is usually thick so give yourself extra time to get to the race! Bag check is easy to get to and you can stay warm inside, which is awesome on cold mornings! I can't recommend this race enough! Very well managed and super fun to bring your family along! I really liked this race! The expo was small and didn't have many vendors but that's to be expected at smaller races. It was still very fun and my family enjoyed the games that were available to play. It was held at a very convenient place in town that was walking distance from my hotel. The scenery on the course was amazing! 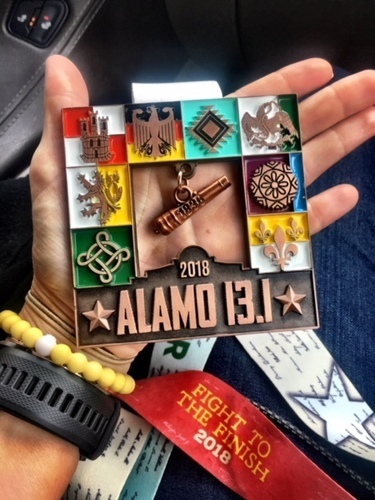 My favorites were running by the Alamo and around the river. There was one downfall and that was at the end of the race. The course had several zig zags and either my garmin wouldn't pick up correctly or the race was a bit short of the 13.1 miles. I ended the race at 12.8 miles by garmin distance. Aid stations were great for me! I didn't have any trouble getting something to drink! The Nuun on the course was great!. I would definitely recommend this race to others! It was a beautiful place to run! The medals were amazing as well! Race management did an awesome job! 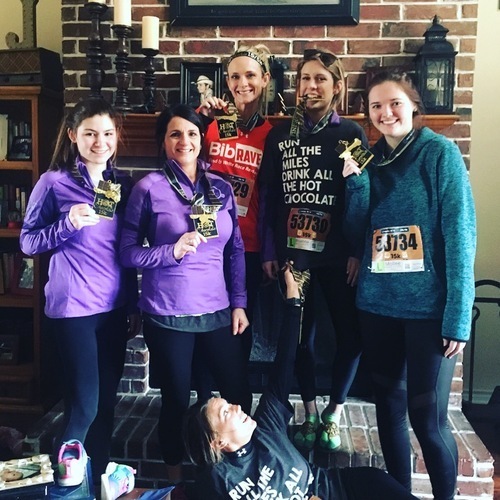 "Run all the miles, drink all the hot chocolate!" I have always loved this race! For me it’s become a tradition that I run every year. 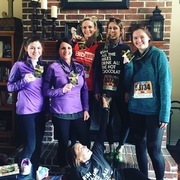 This year I ran with my sister, daughter and friends! It’s usually cold this time of year so the hot chocolate is perfect after the race! And it’s honestly the best I’ve ever tasted! The race course is great. There are some hills, but the fun along the course takes your mind off of that! The aid stations and those volunteering were also wonderful!! This year I had a little trouble with parking and traffic and was almost late to the race. It took me over an hour of sitting in the traffic to get into a parking lot, but I made it just in time to start the race! The post race entertainment was amazing as always! Always a super fun time!! I would absolutely recommend this race to everyone!! Rock n Roll events are always a blast! This race was no exception! The scenery was amazing as always! I love running through Dallas. The Margaret Hill bridge is always a challenge as well as a nice hill around mile 9 on the course. Aid stations were well stocked and the volunteers were very encouraging! Although is was a very hilly course I actually ran a PR by over 6 minutes! I was a little disappointed with the expo. Previous years expos seemed to have many more vendors rather than just event booths. Other than that, the race was awesome! Thank you Rock n Roll for always putting on a great event.